How come I get random foot pain and stiffness? This question has come up quite a bit and there’s several reasons for this. Your foot and ankle are made up of 33 joints and in any of these joints a problem can occur. There’s a ton of reasons such as improper mechanics of the foot, improper shoe fit, lack of support in shoes, excessive “wear-and-tear” of the feet, arthritis, etc. For long-term relief it’s definitely important to find the root cause. In practice I’ve often found that all of these things lead to excessive tension in the foot. Each of the 33 joints in the foot are supposed to move properly, and when they don’t the muscles in the foot get progressively tighter. What can you do right now? 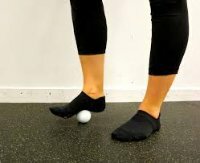 The easiest solution (although temporary) is to roll your foot on a baseball or golf ball. Using the same concept as foam rolling, by reducing the muscle tension in the foot you will feel quite a dramatic loosening of the foot. Try it out! Check out the following picture and roll the ‘X’ spots.